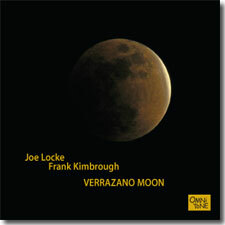 The third recording on OmniTone featuring the exceptional musical piano-vibes chemistry of Frank Kimbrough and Joe Locke, Verrazano Moon captures the duo live, in-concert in February 2006 at the Windham Chamber Music Festival in Windham, New York — the only "jazz" concert of otherwise all-classical series. Full of wonderful original compositions by Joe Locke and Frank Kimbrough, the scintillating live recording includes two breathtaking solo tracks by Frank Kimbrough on Duke Ellington's "Single Petal of a Rose" and Joe Locke on Billy Joel's "She's Always a Woman." From Joe Locke's heartfelt tribute to saxophonist Bob Berg in the title track to abounding musical hijinks abound on Thelonious Monk’s already witty "Trinkle Tinkle," Verrazano Moon captures the entire night's show of the beautiful, mellow, and enchanting music that the Kimbrough-Locke duo is known for — music that will appeal to both jazz lovers and people who don't really care for "jazz." As Joe Locke put it, "Some nights there is magic. Some nights you record. It is a rare event when the magic happens on a night you are recording. This was one of those nights." Buy Verrazano Moon now at the OmniTone store. Recorded live on 18 February 2006 at the Windham Performing Arts Center, Windham, New York. Joe Locke plays a vanderPlas LW series 3.5­-octave vibraphone on this recording and uses Joe Locke Autograph mallets (PJL 1 & 2) by Pro-Mark. Frank Kimbrough appears courtesy of Palmetto Records. This recording is of a concert presented at the exceptional Windham Chamber Music Festival. More information about the WCMF is available at www.WindhamMusic.com. This CD release was made possible through the generous sponsorship of TLCC, Inc at www.tlcci.com.